Add Coolant. This one’s pretty obvious – but often overlooked. Be sure sure to open the hood & check your coolant level. Add fluid if it is below the indicator lines on the reservoir. Simply add the coolant until it reaches the indicator line and be sure to replace the cap on the reservoir when done. Engine coolant should be a 50/50 mix of water and coolant — many coolants are sold this way but you can also purchase concentrated coolant and mix in the appropriate amount of water. Be Persnickety about your Parking Place. Finding a parking spot in a shady area can translate to a 15 degree difference inside the car than when parking in the sun. This means you’ll not only return to a more comfortable car but you will prolong the life of your vehicle as well. It’s a great idea to keep a sun shade in the car in the event there is no shade available. The UV protection from the sun shade will guard against sun damage to your car’s interior and keep it much cooler when you return to the car. Rethink Recirculation. Avoid using the recirculation setting on your car until the air conditioning has sufficiently cooled the interior of the vehicle. Using it right away will only recirculate the hot air already in the car and will make the vehicle work harder to cool down. Monitor Your Temperature Gauge. It’s easy to forget about this little-observed gauge on your dashboard since it’s not as frequently checked as the speed gauge or gas gauge, but it’s especially important to check this little guy during the hot summer months when driving. The gauge should point toward the center. 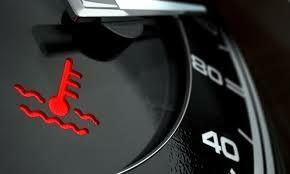 If you see it pointing towards the “H” or Hot indicator, pull over and allow the engine to cool before proceeding. Enlist Your Lower Vents. It may seem counterintuitive, but using your lower vents when turning on the A/C instead of the upper vents actually pushes the hot air out of the vehicle more quickly since hot air rises. When turning on the A/C, simply put the lower vents on max and once the car cools, you can switch to the upper vents at a lower setting.